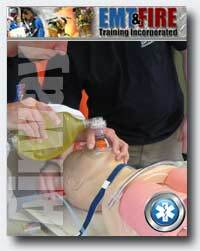 This EMT Basic Airway Management CEU Course is available as an online, self paced, distance learning (DL) course. The Self Paced EMT Basic Airway Module CEU lecture may be completed on the students own schedule. Students login, watch the lectures and then take an assessment exam over the material. Once the exam is successfully completed with a score of 80% or better, the student is automatically issued a certificate of completion. Multiple exam attempts are permited. You may apply this course to the NREMT required hours of NON-live continuing education. 1. Demonstrate an understanding of the physiologic processes involved with respiration. 2. Choose the correct airway management technique for various scenarios. 3. Describe appropriate use of a nasopharyngeal airway. 4. Demonstrate knowledge of proper BVM techniques during various scenarios. 5. Show an understanding of the physiologic processes, signs and symptoms of hypoxia.